DOWAMA'S 46th Annual Clergy Brotherhood Retreat will be held at the Spiritual Life Center in Wichita, Kansas, Tuesday–Friday, February 13–16, 2018. 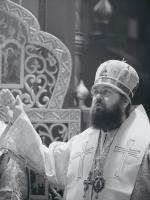 The guest speaker will be Bishop Irenei of the Russian Orthodox Church Outside of Russia (ROCOR). His Eminence will address his chosen theme in seven talks. (Read His Grace's biography on Orthodox Wiki. Please note that we will begin at 5:00PM with Lenten Vespers (since it will be Tuesday of Cheesefare Week). If you have not yet done so, register today for the retreat by having your parish treasurer send a check (payable to "DOWAMA Clergy Brotherhood") in the amount of $450.00 to our Clergy Brotherhood Treasurer: Father John Salem - St Elijah Church - 15000 North May Avenue - Oklahoma City, OK 73134. For proper credit to be given, please be sure that your name appears on the memo line.